Nigeria international Aaron Samuel bagged a hat-trick as CSKA Moscow crushed Spanish club FC Torrevieja 7-0 in their final warmup game staged at their training camp in Campoamor on Wednesday afternoon. Samuel broke the deadlock in the 13th minute and the scoreboard was unchanged at the end of the first half. 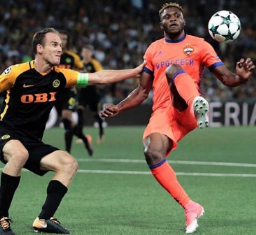 Two minutes after the intermission, the Nigerian doubled CSKA Moscow's advantage and any hopes the opponents had of mounting a comeback were put to bed when he grabbed in his first hat-trick for the club in the 56th minute. Fedor Chalov netted a treble in the second half plus an additional goal from Vitalik Gironkin secured a win for the Muscovites. Leicester City loanee Ahmed Musa was not utilized by manager Viktor Goncharenko after going the distance and scoring two goals against Elche on Tuesday. Samuel recently dismissed speculation linking him with a move to Norwegian team Molde before the close of the winter transfer market in the country.